Q: New restroom fixtures have hand dryers built into faucets. What are the advantages (or disadvantages) to this type of design? Haas: One of our newer fixtures provides touch-free soap, water and hand dryer all in one fixture. There are many advantages to this integrated design. Bradley engineered the dryer to work in tandem with the basin to minimize splashing of water outside the sink. This addresses water splashing on floors, walls and the user, minimizing slips and falls. In effect, the built-in hand dryer design promotes a cleaner and safer restroom environment. The adjustable speed dryer used with this all-in-one design is engineered to balance airflow and noise, and uses decibel levels lower than other high speed dryers — 76 dB (high speed) to 64 dB (low speed). Its heated air stream dries hands in 12 to 15 seconds. By limiting noise and drying time, this dryer is more user friendly. The touch-free and easy-to-access aspect of the dryer right next to the faucet addresses users’ diverse accessibilities and challenges. It is ADA compliant and supports universal design. Those with mobility issues using this fixture needn’t move around the restroom with wet hands in search of a dryer or towels. In all, the adjustable speed hand dryer used with this system eliminates paper towel waste and frequent waste bin emptying, so it frees up maintenance time and costs. The dryer is 96 percent less expensive to use than paper towels, benefiting the environment and facilities’ bottom lines. Moreover, this self-contained fixture is highly adaptable to restroom environments. It’s all-in-one cohesive design opens up wall and room space by eliminating the rigid wall and clunky countertop clutter of three separate hand washing components. Its compact footprint allows greater design flexibility and possibilities throughout the entire restroom. Gagnon: A well-designed integrated sink system offers every advantage. As the most hygienic, sustainable and cost-effective way to wash and dry hands, it truly represents the future of the commercial restroom. Seeing a need for a more sanitary and convenient hand hygiene process, Excel Dryer collaborated with a design firm to develop a one-stop solution. The result is an engineered sink system, which takes all the benefits of a high-speed, energy-efficient hand dryer off the wall and places them on the sink deck with the faucet and soap dispenser. 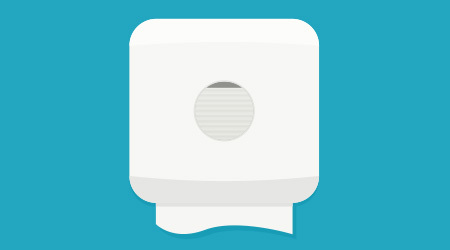 Together, the three sensor-activated, high-efficiency fixtures reduce touch points and eliminate soiled, discarded paper towels, promoting superior hygienic standards. In addition, the dryer’s HEPA Filtration System removes 99.97 percent of bacteria from the air stream at 0.3 microns, creating a clean airflow and improving the indoor air quality the more its used. The true hygienic differentiator of this particular system is how the sink basin and hand dryer are designed specifically to work together. The dryer reverses and fans out the high-speed airflow to blow down and away from the user, toward the bottom of the gradient sink basin. The basin is designed with the appropriate depth and angles to keep the air and water in the sink and away from the user, creating the ultimate user experience. Another key advantage of the integrated sink system is its sound suppression air-delivery system. Sound-absorbing foam and a Helmholtz resonator completely eliminate noise from the motor and significantly reduce air deflection noise, reducing sound levels and improving overall sound quality. The dryer mechanics are enclosed under the sink, away from the user, further reducing noise. Additionally, the dryer includes adjustable speed and sound controls to regulate the sound level, an invaluable factor for sound-sensitive environments. Q: How can distributors influence the decision to get a facility to switch to a hand dryer that is built into the faucet? Haas: Switching to a hands-free hand washing system will lower facilities’ cleaning and stocking time and hard costs associated with restroom maintenance. Restroom cleaning is also easier due to the streamlined design of the soap, water and dryer all in one single component — rather than more involved cleaning of three separate hand-washing components on the deck and in the adjacent area. Plus, surrounding walls and floors stay cleaner and dryer, since the dryer and bowl work together to eliminate the spraying of water. Hands-free designs also eliminate the need for purchasing and stocking paper towels, and frequent waste bin emptying. By freeing up maintenance time and minimizing frequent restroom cleanliness issues, facility staff will have less maintenance nuisances, take more pride in the restroom’s appearance and have more time to devote to other work. Gagnon: Knowing the ins and outs of the products they carry and being on the “front lines” in terms of customer interaction, distributors are in the ideal position to influence decision makers. At a high level, they can relay the fact that the integrated sink system integrates the components of proper hand hygiene in an expertly engineered design. It places three high-efficiency, hands-free fixtures together on the sink deck, allowing the user to wash and dry hands hygienically, conveniently and effectively in a single process. Another reason facilities choose to adopt this system is for its unmatched array of design options. With this system, individual and connected basins are available in Corian, quartz or natural stone. The enclosure can be a matching solid surface or laminated with wood grains for a more upscale, residential feel to the restroom aesthetic. The system may be alcoved, wall hung with finished ends, or free standing with legs. Even trash receptacles and baby changing stations can be added to the design, incorporating multiple key elements into one product solution. As a customizable, efficient, sustainable and user friendly hand-hygiene solution, this system can be the centerpiece of any commercial restroom.